I spent this morning exploring the ruins of the ancient castle, which was very interesting, and commands wide views of the two bays on which Scarborough is situated, then, after lunch, I got out the bike, and passing Peasholm Park, I joined the Whitby road. Climbing out of Scarborough I ran level for a time, then dropped down a steep hill with a nasty bend in the middle, to a bridge. Here is Scalby Mill, a picturesque old watermill. Up again and along to Burniston, a pretty, orderly village, with a profusion of roses growing on the walls, and the picturesque red roofs peculiar to this district. I believe they are prevalent all along the East coast. Just at the end of the village, I joined the Hayburn Wyke road, but then left it in favour of a doubtful looking track that ended on the cliffs. As the cliffs were very fine looking, I walked with the machine along the edge. A cornfield came to the edge a little farther along, giving me little space, for I dare not go too near, in places the ground had given way leaving a deep gap, and it is a good two hundred feet down. At length a notice warned me that no one but ticket holders were allowed here, ‘Tickets to be obtained from the Hotel, threepence each’. I was not going back, and there was no other way, so I carried on through some pretty woods to the Hotel, where I bought a ticket, dumped the bike, and proceeded on foot to explore the Hayburn Wyke Estate. Passing through some beautiful woodland scenery, I came to the shore, where a beck tumbles over the rocks into the sea. I had a scramble about the cliffs, then coming back, I followed the babbling stream by a sylvan footpath, coming at length to the Hotel again. The grounds are very extensive, and one could spend a full day around here. Rejoining the road, I climbed out of the Wyke, then dropped down to lovely Staintondale, across, and up again to the Shepherds Arms, where I took a byway which led me on the Whitby road just below the Falcon Inn. At a little, old world cottage I had a good tea. When I remounted, I found a boot stud in my rear tyre, but the puncture was very soon repaired, and I proceeded through some fine pine woods to Burniston again, where I turned right for Scalby. Right again, in the village, I passed the old church and started climbing. For two miles I tramped uphill, along the beautiful, shady road to Suffield, where I obtained some fine views of the surrounding country and the sea, then downhill along a switchback, and through a kind of park to old-world Hackness. Now came a three mile stretch through glorious woodlands with many pleasant waterfalls and clear streams, through the Forge Valley to Ayton, where I turned for Seamer and soon reached Scarborough. 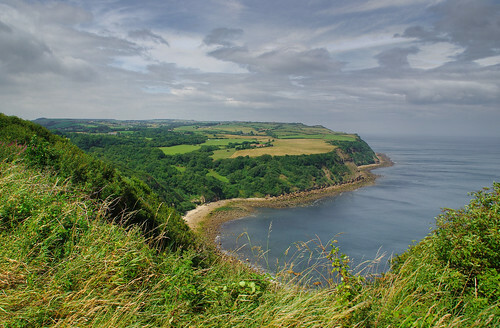 I got mixed up here, and found myself at Scalby again, from where I reached Burniston, and so back to Scarborough. So far, I have obtained a beautiful impression of the district.